If you are looking for the best trampoline for your backyard, you are in the right place! There are a lot of trampolines for sale these days, so I did a lot of research before purchasing what I thought was the best trampoline for my two boys! 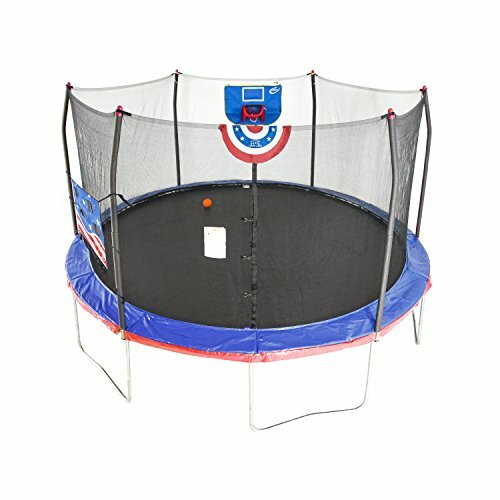 There are several types of trampolines for sale: spring-free trampoline, rectangle trampoline, oval trampoline, trampoline with basketball hoop, I was not sure where to start! 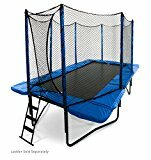 I wanted to get the best backyard trampoline for my boys, something sturdy, top rated, and quality, but of course, affordable for our budget! The best trampoline is the one that works for you! Evaluate your space, your needs and your wants and after reading below, I am sure you will find one that meets the criteria for the best trampoline for your family! I have fond memories of hours on backyard trampolines and as a gymnast I remember following when trampoline was added to the Olympics! I wanted to be able to share that joy with my boys and give them a source of outside fun and exercise! With smaller and smaller backyards, less playing on the street with neighbours and the technology available to our kids these days, It is not always easy to get kids outside. 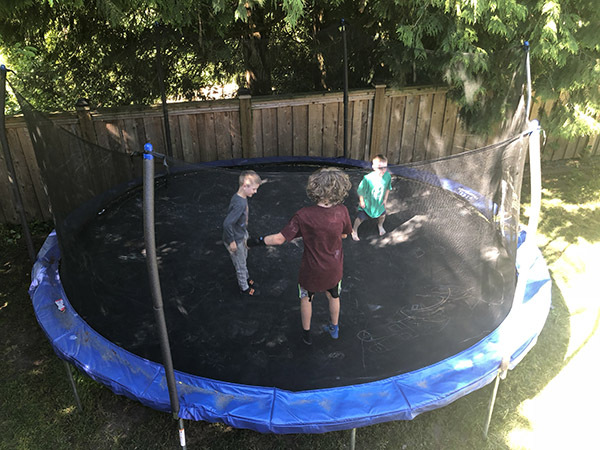 A new trampoline (instead of using their bed as a wrestling ring) was something that I hoped would help get them out there! The first thing to think about when buying a kids trampoline is to evaluate your needs, your backyard space, and the various styles and accessories available. 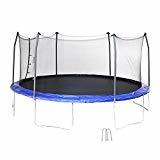 While a cheap trampoline for sale may seem attractive, when you compare the safety features, spring size, assembly and durability, you might want a read up on reviews and pick one of the top rated ones below! I suggest you get something your kids can grow into if they are young. 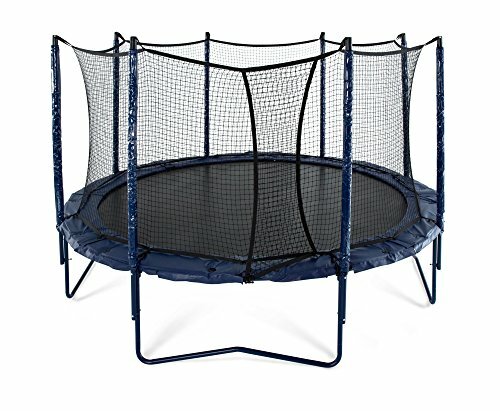 I have made the mistake of buying a toddler trampoline that worked until my boys were about 6 and then found myself buying a new one, as they had outgrown the small trampoline that I had purchased. I am not saying that toddler trampolines are bad, I actually have reviewed them here. But make sure you are making an age appropriate choice. 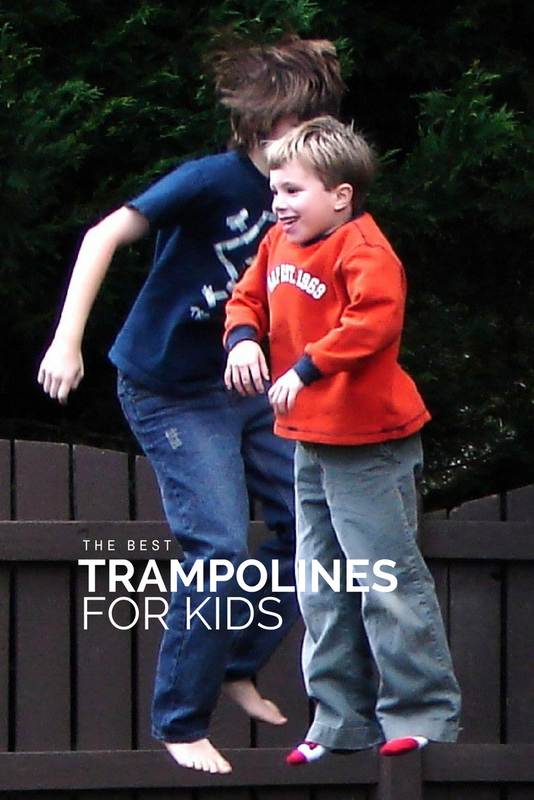 Here are 15 Safety Tips for Trampolines to keep in mind. While you are planning your summer backyard, also consider an inflatable water slide to keep your kids cool in the summer! 1.5 So How much is a Trampoline? 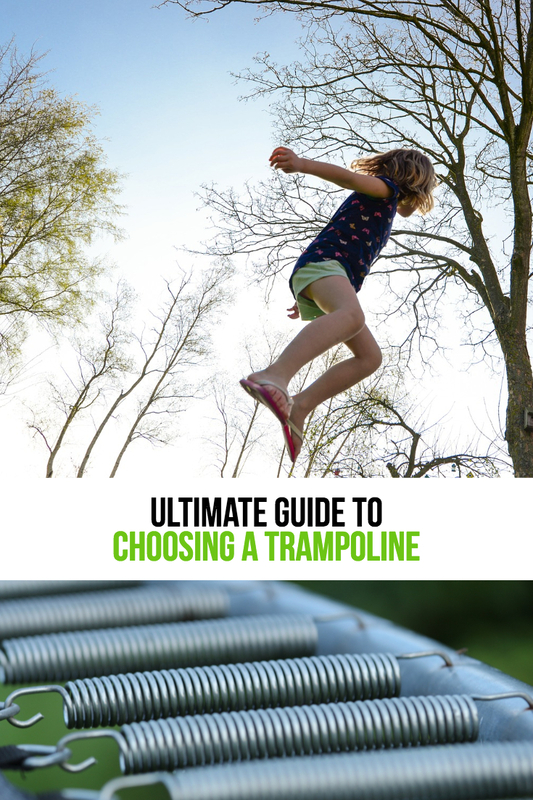 Until I started looking for a new trampoline that my boys could grow into, I honestly had no idea that there were so many different types of trampolines. I have explained each of them in a bit of detail below, which should help you choose the right style and size for your backyard. Probably the most popular backyard trampolines with nets are the 12ft or 14ft round trampoline. They have the best value trampolines but also very high quality and expensive trampolines. They come in 8ft, 10ft, 12ft, 14ft, 15ft as well as smaller and larger sizes. 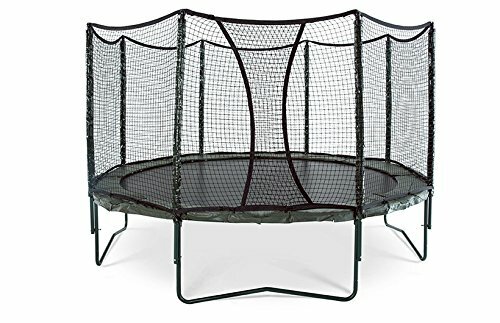 If you are looking at a typical trampoline, this will probably be the first one you come across in your search. They are the most common trampolines in backyards today. The ones that I have reviewed below are all large trampolines with nets, but I if you are looking for something that is 8ft or less, check out my small trampolines page. In the photo just above this section, you can see an example of an oval trampoline with 10 kids on it! Most of those kids are about 6-7 years old and my kids are included in that bunch! An oval trampoline is an excellent option if you have lots of backyard space! The one above, is 17′ at its largest diameter! It is one of my kid’s favorites to use! They love all of the space that the oval trampoline offers! Rectangular Trampolines come in various sizes and are great for narrow yards. They take up less space than a round model. 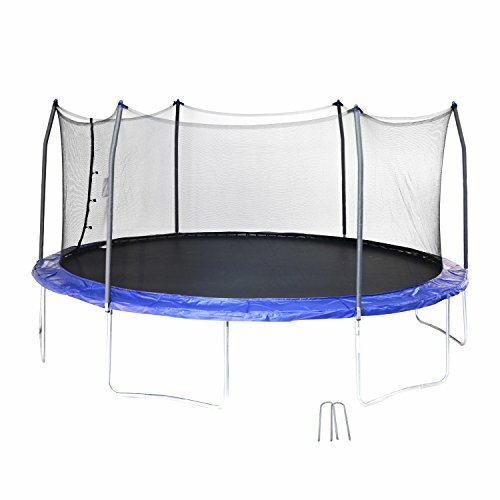 A rectangular trampoline is often known or referred to as a best bounce trampoline and they are often used for gymnasts. The backyard variety however, is perfect for children. If you have ever watched trampoline or been to a trampoline class, they use competition style rectangle trampolines. While getting one of these for your budding gymnast is no where near the same as the ones used in the gym, it can possibly help them get comfortable with the square style. But in my case, I was buying a trampoline for some fun for my kids, while I did not go with this one in the end, it was only because it did not suit my backyard needs. If you have space constraints, this is probably the best outdoor trampoline for you. The Springless designed trampolines have designed the entire surface to jump on. They are available in oval, round and square and the design means that children can not get caught in the springs. These trampolines tend to be in the higher price bracket, but some brands, such as Springfree, come with a 10 year warranty and guarantee that their trampolines can be kept outdoors all year round! If you remember bouncing in the backyard as a kid, you probably never came across one of these trampolines. I sure did not. But their safety features and quality build are making them an up and coming, popular choice. 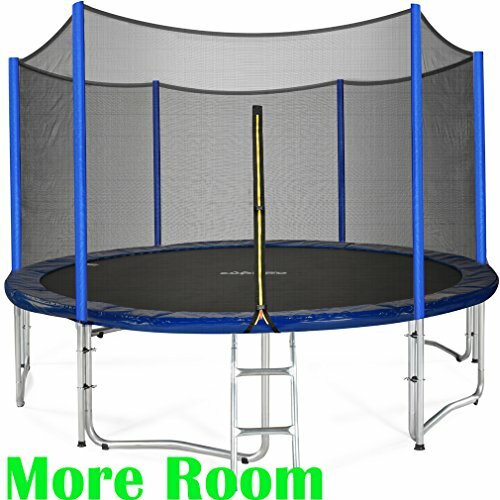 They do take up more room than you might imagine however, but if you are buying a 12 foot model, you have 12 feet of bouncing space, where a traditional round 12 foot trampoline you would have about 10 feet of bouncing space and the other two feet would be springs. After seeing young children bouncing and running around on these, they are a great choice for the safety conscious backyard! Because of their design, the springs are on the side, which makes them quite tall. Nothing a little footstool or ladder cannot handle though! And those little ones, they make it up there just like the big kids! 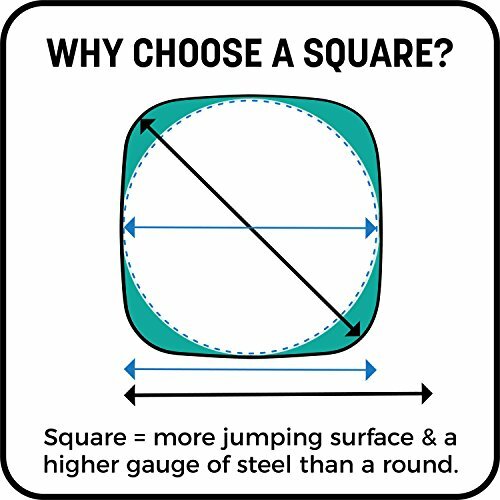 Square Trampolines are not as popular as round or oval trampolines, but that does not mean they are not equal or better. 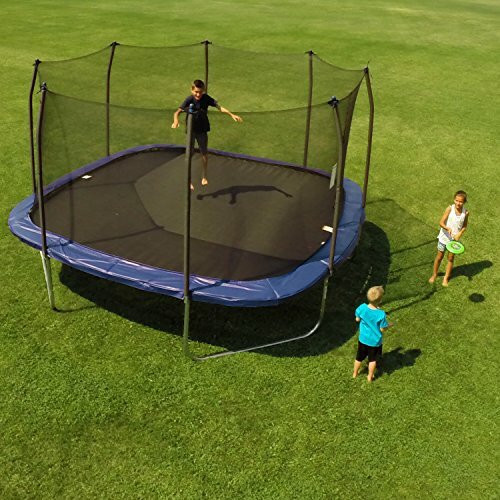 A square trampoline actually offers more jumping space than a round one. 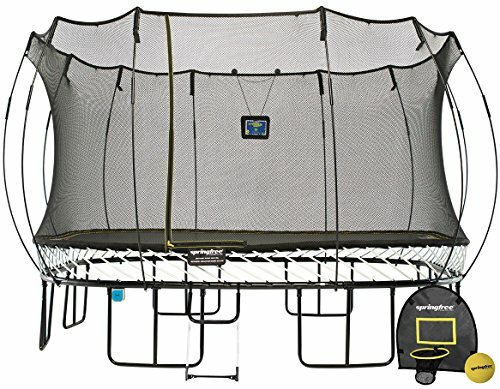 You can get a square trampoline with springs or a springless version. If you look at the photo below, you can see how the jumping space of a square trampoline is larger than that of a round one. Something that i remember as a child is playing 4 corners on an old rectangular rubber style trampoline. I think it was orange. Do you remember those? A square trampoline gives plenty of creative options for kids to play. A great choice in my opinion. Octagon trampolines offer yet another shape for the best user experience. These are a high bounce trampoline and the one that I have included below is made of very high quality materials. 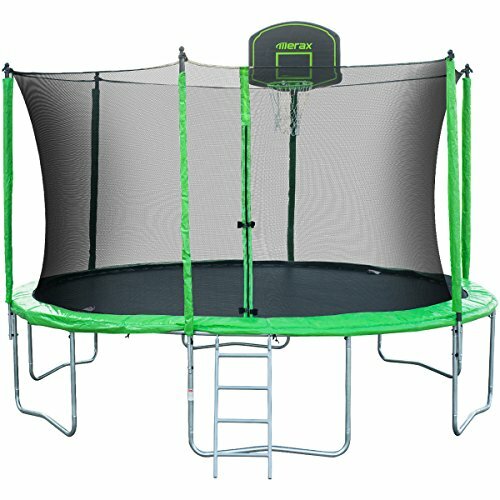 These may not be as popular as the round ones due to the price, (the round ones have several brands and quality differences, but there are few octagon ones on the market) but check them out before discounting them, as they are one of the bounciest trampoline brands out there. These are the 10 best trampolines that are listed in the quick comparison chart above. This will give each one a bit more detail and help you pick which one is right for your family! 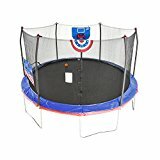 Skywalker Trampolines 15-Feet with Basketball Hoop with Enclosure Combo is the perfect trampoline for those who want a big jumping surface and have a budget of under $500. This is actually one of the most popular trampolines on the market. The frame is made of heavy duty galvanized steel making it both secure and weather resistant. 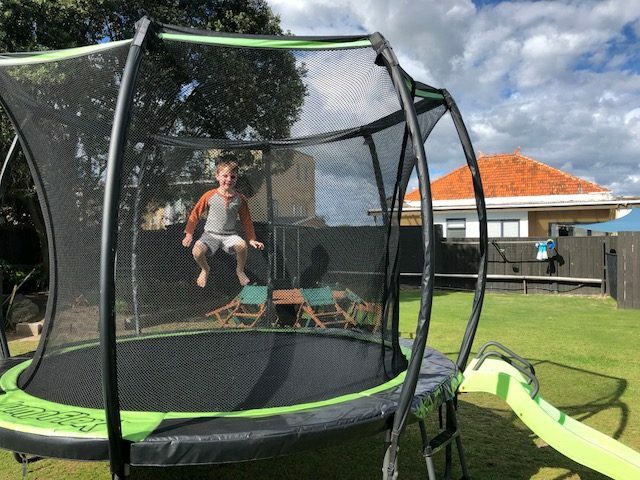 The Skywalker Trampoline’s enclosure net uses an innovative design attaching to the jumping mat itself rather than the trampoline frame. This eliminates any gaps between the jumping surface and the enclosure giving a safe and fun jumping area. It has a weight capacity of 200 lbs. This trampoline has 96 springs and the spring cover mat come in various colors. The jumping mat is 37 inches from the ground. Because this is such a popular model, I did a full review here. 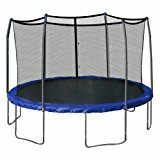 This Jumpsport StagedBounce 10’x17’ Rectangle trampoline for sale is ideal when space is at a premium. As I mentioned above, rectangle trampolines take up less space than a typical round trampoline. As with all of the trampolines I have reviewed, it comes with a safety enclosure. It also features 108 high performance springs, a blue, high density, trampoline pad and a 12 gauge frame. The safety enclosure has two back up support systems making it the best safe trampoline option. There are no zippers to worry about breaking on this trampoline net, it has an overlapping design so your child can slip in. This safety feature means there are no open holes in the net. The safety net poles come with vinyl pole sleeves. The trampoline mat is made from industry-leading Permatron® jumping mat fabric and is 40” from the ground for better trampoline clearance. The bed has 10 rows of stitching and a UV shield.The Spring/Frame pad is blue in color, 17″ wide and 1″ thick. High density, closed cell foam padding is used across the entire pad surface.The Jumpsport StageBounce Trampoline is rated for a max 225 lb jumper. 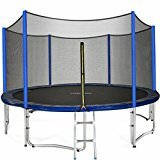 This AlleyOOP PowerBounce Trampoline is 14′ and provides outstanding bounce performance, has a high quality frame for support and safety. It boasts over 50 patented performance and safety features. Its patented technology helps with shock absorption and optimizes bounce performance. 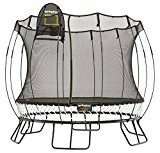 In the event of an awkward landing, the shock absorption of this top rated trampoline will help make a softer landing for your child. The foam pad is made of 1″ high-density foam with reinforced PVC and is dark green color. The mat has 10 rows of stitching and a UV shield, ensuring it holds up to lots of use! This heavy duty trampoline has great reviews as one of the best trampoline brands on the market. It is also available as a 12′ Trampoline . It is rated up to 350 lbs for a single user. The Jumpsport 14’ Elite Powerbounce trampolineis designed for 7 to 10 years of bouncing, but some with a 15 year frame warranty! It is rated for 295 lb jumper. It has a patented dual spring assembly which improves shock absorption and bounce performance. It has 96 primary springs plus 32 power spring for 128 springs total. The frame height is 35” for good ground clearance. The trampoline frame is made of 1.75” diameter cold rolled steel that is powder coated to protect against the elements. The trampoline mat has 10 rows of stitching and a UV shield. 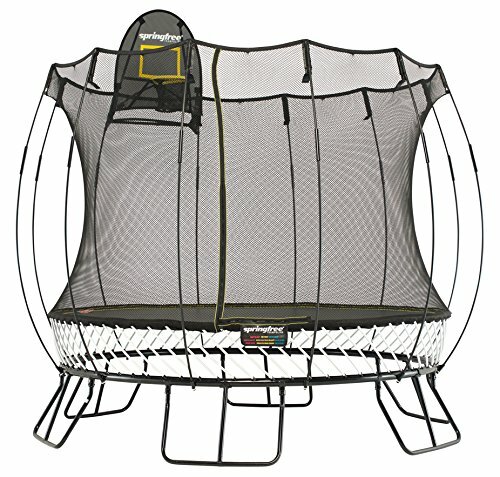 the trampoline safety net does not have zippers, it has an overlap safety feature, so there is never any holes open for your child to fall out. The Zupapa trampolinecomes in 12’, 14’ and 15’ sizes. When you buy a Zupapa trampoline, you get everything you need (and more). 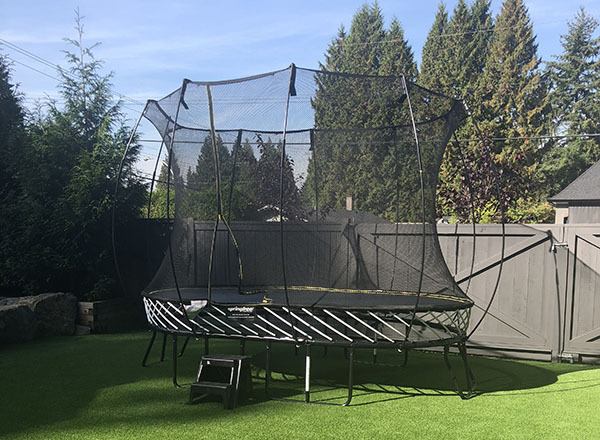 Your purchase includes the trampoline, trampoline safety pad, trampoline ladder, trampoline enclosure net, trampoline cover for rain, and T-hook for installation. 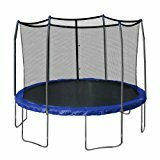 It is one of the best deals on trampolines with everything included and is also rated for over 300 lbs. You can read reviews from owners here. 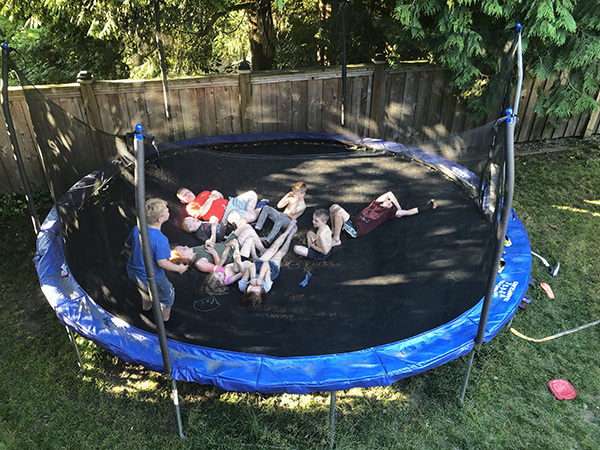 This trampoline has a lot of great reviews from owners who have even considered buying a very high end trampoline and in the end, were very satisfied with this purchase, and spent a lot less money. 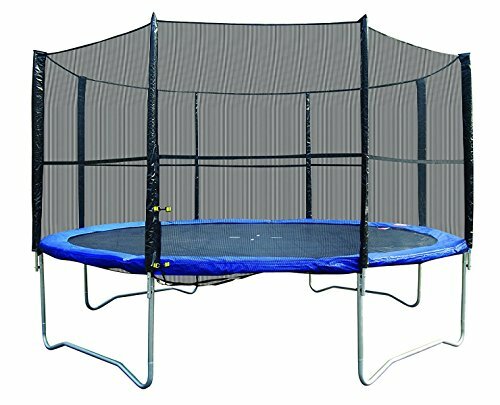 Skywalker Trampolines 12’ Round Trampoline with Enclosure is an ideal alternative for the consumer that does not have room for the 15 foot model mentioned above. Slightly smaller and with 72 springs it is still something your kids will enjoy. It is a great option for those wishing to purchase a cheap trampoline. Do not let those big budget trampolines make you feel as though these will be terrible. They are not. They are fun trampolines! The kids will have a blast! A trampoline in the backyard is better than no trampoline! Low weight limit. Not ideal for teenagers or adults. Skywalker Trampolines 14’ Square Trampoline provides for hours of fun with this unique shape. As I mentioned above, the square shaped trampoline provides more jumping surface that the traditional 15’ or 16’ Round Trampoline. 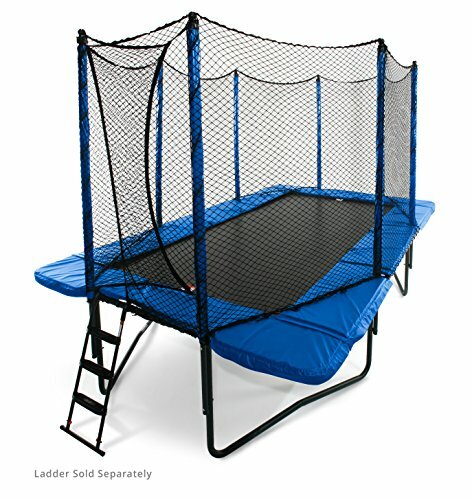 With unique safety features such as a patented No-Gap enclosure and T-socket construction, parents can be at ease knowing that their kids will enjoy a safe and fun jumping experience. 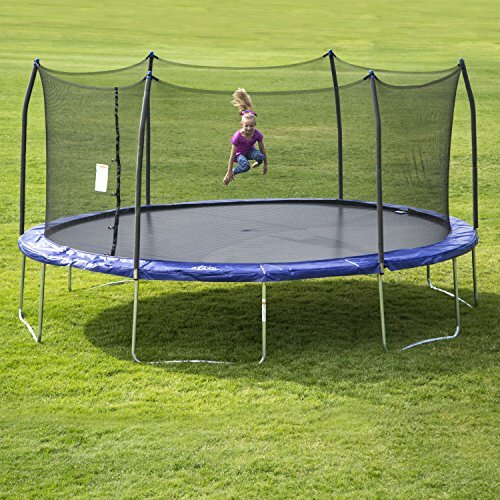 The woven jumping mat made of heavy-duty UV protected polypropylene material prevents slipping on the trampoline surface. This trampoline is rated for 250 lbs. The Spring free trampoline is an outdoor trampoline designed for spacious backyards. This no spring trampoline is equivalent to a 16’ trampoline with springs. It is rated for 220 lbs and the mat height is 3.3’ off the ground. It has a 10 year warranty on the whole trampoline so is an ideal long term purchase. The Flexinet is resistant to tearing and UV coated. The frame has three layers of rust protection. It is designed to withstand harsh sun and snow and can be left up all year round without damage. There are various square trampolines for sale but this model includes a basketball hoop and ladder. The frame of this trampoline is well below the jumping surface meaning that your children will not have a metal frame to hit if they lose control while jumping. It is one of the best rated trampolines for safety. 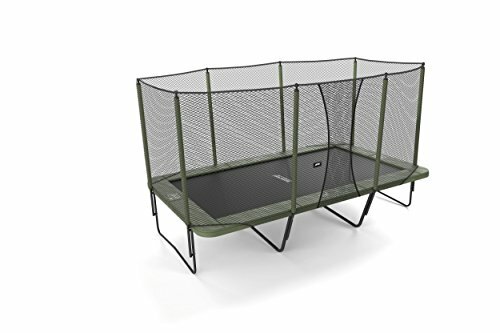 This smaller Spring free trampoline is an option if you have less space than the larger model. It is also rated for 220 lbs and the mat height is 3.3’ off the ground. As mentioned above, the Springfree brans is one of the best trampoline brands to buy for longevity. It has a 10 year warranty on the whole trampoline. The Flexinet is resistant to tearing and UV coated. The frame has three layers of rust protection. It is designed to withstand harsh sun and snow and can be left up all year round without damage. This model includes a basketball hoop and ladder. The frame of this trampoline is well below the jumping surface meaning that your children will not have a metal frame to hit if they lose control while jumping. If this trampoline is in your budget, I would reccomend the larger model above, unless space constraints are a factor. Then this 11″ square model is going to be your best bet! This oval trampoline is an option if you have a narrow yard. It is also a great choice for multiple jumpers (although safety recommendations will not be able to tell you that). This Oval model is rated for 220 lbs and the mat height is 3.3’ off the ground. The Springfree trampoline warranty and build makes it the best trampoline for enjoyment, year after year. This model also has a UV coated net and is tear resistant. With a FlexiNet enclosure designed to cushion jumpers and prevent falls, you won’t need to worry about the safety of your kids when it comes to play and having fun! The frame has three layers of rust protection. It is designed to withstand harsh sun and snow and can be left up all year round without damage. This model includes a basketball hoop and ladder. The frame of this trampoline is well below the jumping surface meaning that your children will not have a metal frame to hit if they lose control while jumping. It is equivalent to a 10 x 15 foot trampoline with springs. 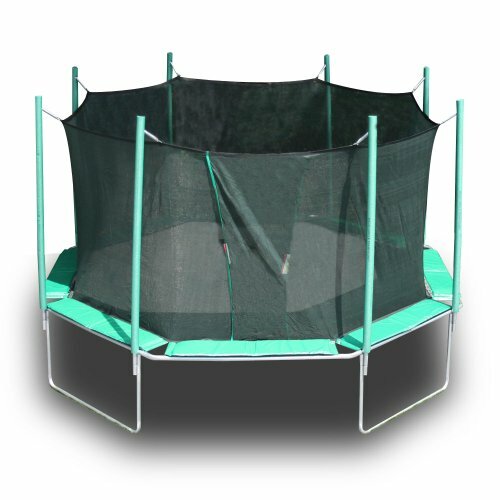 This spring free 10ft trampoline is equivalent to a 12ft trampoline’s jumping area and is made for smaller families or smaller spaces than other Springfree models. 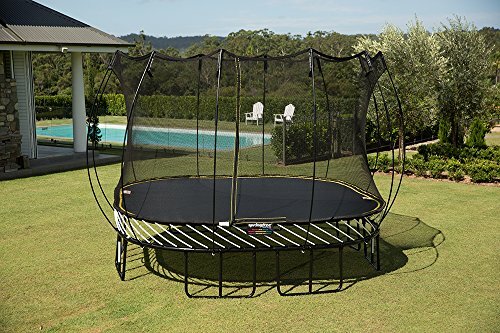 While a lot of my recommendations are for large trampolines, I understand that not everyone has the space for a big trampoline. The trampoline mat is 3 feet off the ground. 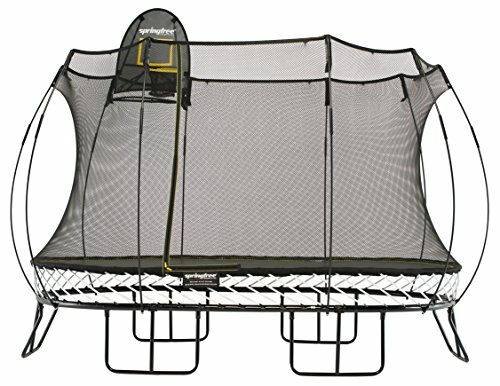 As with the other Springfree models, it has a 10 year warranty on the whole trampoline. The Flexinet is resistant to tearing and UV coated. With a FlexiNet enclosure designed to cushion jumpers and prevent falls, you won’t need to worry about the safety of your kids when it comes to play and having fun! The frame has three layers of rust protection. It is designed to withstand harsh sun and snow and can be left up all year round without damage. This model includes a basketball hoop and ladder. The frame of this trampoline is well below the jumping surface meaning that your children will not have a metal frame to hit if they lose control while jumping. 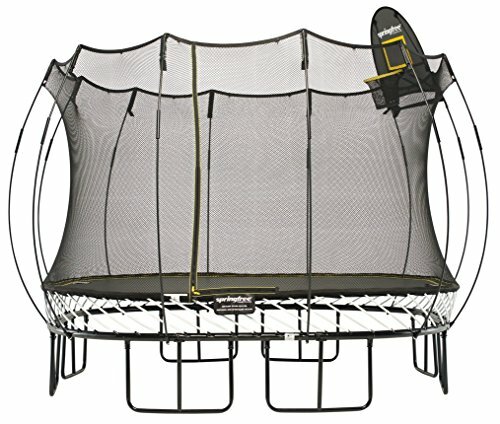 This inexpensive 12 ft trampoline is the perfect size for small backyard homeowners who do not want a huge trampoline. 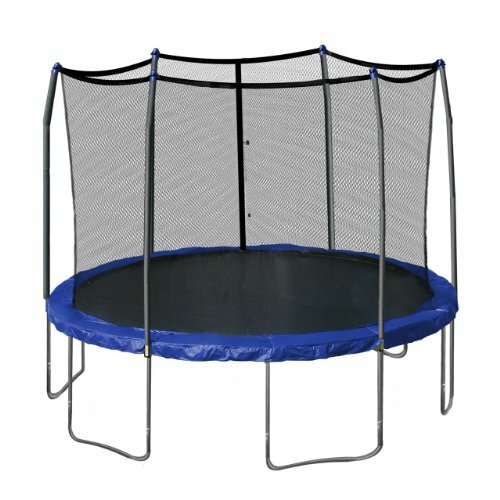 It has a galvanized steel frame, 64 springs and has a UV coated jumping mat. It is rated for 220 lb jumper. 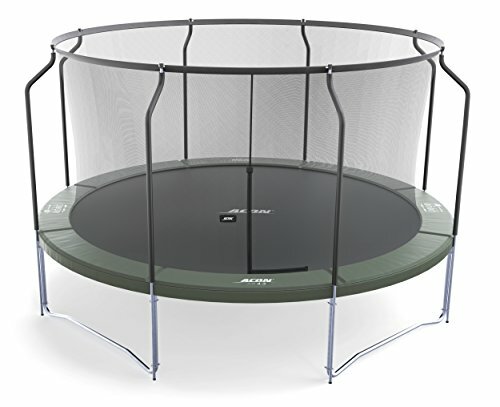 The ACON Air 4.3 is a 14 ft trampoline in the mid budget level. Acon also makes a 15 foot model if you have the space, and a 12 foot model for smaller back yards. 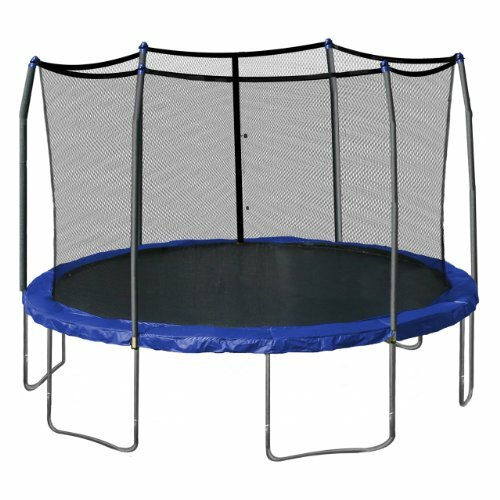 Its heavy duty galvanized frame and quality build makes it a great trampoline for the mid-range budget. It has 96 springs and the mat is 36″ off the ground. It does not have a single user rated limit, but says the total load limit is 800 lbs. The ACON Air Sport 16 is a 16 ft. X 9 ft. Heavy duty rectangular sport trampoline built to last. the ACON brand offers a 5 year warranty on the frame, which is higher than most other brands in the mid-range trampoline market. If you have a child interested in gymnastics, they will probably gravitage to this trampoline’s rectangular shape. If you have a smaller backyard, this is also a great option for your kids. As with the round trampoline above, the ACON does not have a single user rating but a max load of 800 lbs. Now this does not mean you should put four 200 lb men on it and expect it to give any bounce. You would probably do a lot of damage to the trampoline (and even eachother haha). This model has a 40″ ground clearance for the mat, which is good. This trampoline has the slide in style net which means there are no zippers to be broken and no possible openings. The Magic Circle Octagon trampoline is the last on my list of top trampolines, but that does not mean it comes in at the bottom of the rankings. I love the uniqueness of the shape. I also love the 450 weight capacity. The highest single user load capacity I have seen. maybe higher than needed, but it is likely a testament to good quality springs. This trampoline is unique as it has the safety net sewn right into the mat. When you buy this, make sure to get a spring hooktoo, your hands will thank you! Since it is unique, you will have to get replacement parts from Magic circle. But I recommend trying to use the correct brand stuff anyways! Just makes compatibility easier! The Skywalker Oval Trampoline may the the last on my list, but it does not mean it is not one of my favorites! I love the massive jumping surface of this trampoline! You can see how much room my kids have on it in the photo below! The oval shape gives a noticeable longer jumping surface so you get the best of a round and very close to a rectangular model in one! As with other Skywalker models, there is no gap between the net and the jumping surface, so the kids cannot get under it or risk getting caught up in the springs. Its frame is made of 16ga galvanized steel and is UV coated. It is rated for 200 lbs but I have seen a pile of kids on without issue. When they start getting older, the weight limits will be more noticeable. 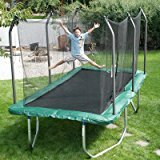 This trampoline is recommended for ages 6+ by the manufacturer, but I would give a personal suggestion of 4+ if you have a super active kid! No Gap safety mat so children cannot fall through the mat to the springs. 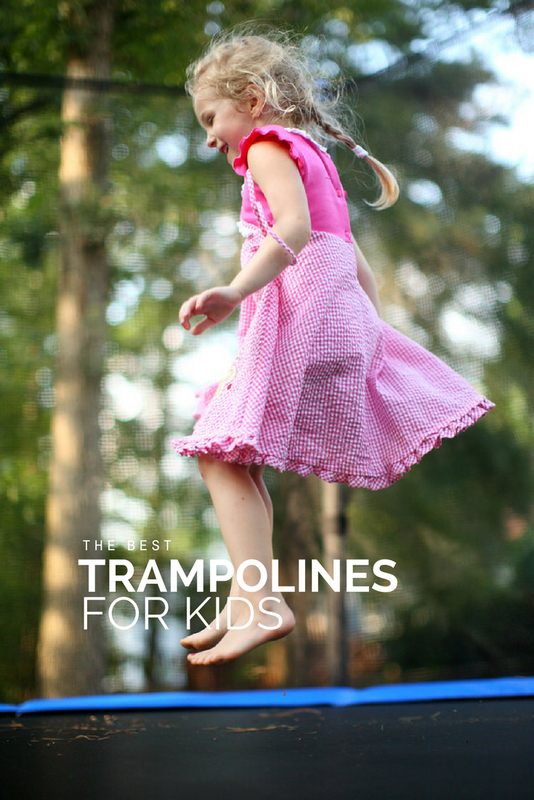 Trampoline Games are a fun way to keep kids outside and active! This is the Skywalker 17′ described above! It is massive! So How much is a Trampoline? If you have gotten this far, then you have probably already found out that trampoline prices can vary from a few hundred to a few thousand dollars. The best kids trampoline is the one that suits your family from a use, safety and price perspective. 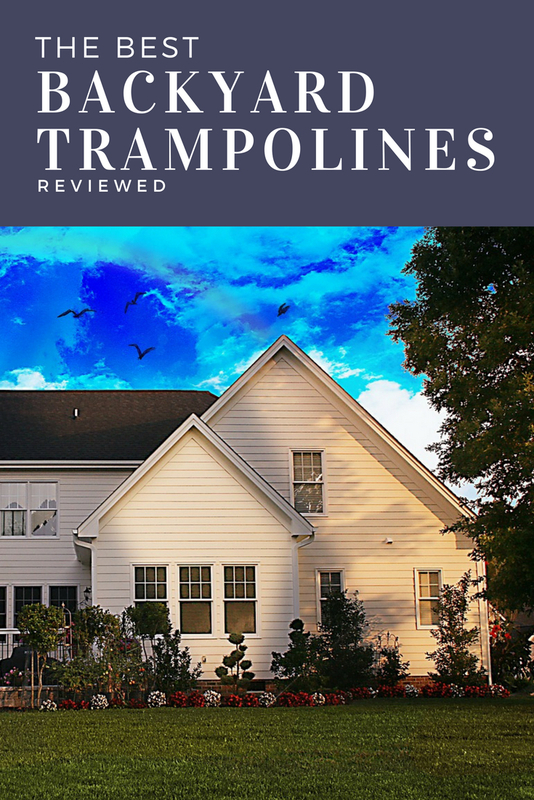 All of the trampoline reviews that I recommend in this guide are full size backyard trampolines and come with safety nets. The prices are determined by the quality of the springs, the mat, the legs, poles and the net. In the case of a cheap trampoline, you want to ensure that the climate where you live will not hinder its performance. For example, harsh winters and summers can break down the foam padding, and heavy storms or snow can damage the safety nets. Keep in mind, a trampoline is an investment so read my trampoline reviews for the best deals on trampolines and then you can make an informed purchase for your children! Something else to consider when it comes to the price of a trampoline is your own children. If you think they will roughhouse on the poles and try to use the net as a wrestling ring, then you are going to have bent poles and a ripped net in no time. If falling into the net is something you know they will be doing often, take that into consideration when you look into a trampoline. While easier said than done, I try and try to tell my boys that they can play fight on the trampoline, but is is not a WWE arena and they should not be running and bouncing off the net. It is supposed to be for safety just in case they lose control. But you know boys, sometimes they only hear half (or less) of what I have to say. After investing in the best trampoline for your kids, you do need to take some maintenance into consideration! Especially in the winter! You can read more about winterizing your trampoline. A few other things to keep in mind are to keep your trampoline free of debris. Use a broom to brush off leaves and needles before your kids start jumping! Routinely inspect the springs as well as the safety net and pads. The pads can be washed with a mild cleanser to remove any tree sap or other sticky debris that has fallen on it. 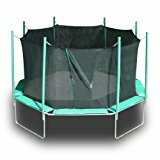 I would love to hear if you decided on one of the best trampolines I have recommended or if you went with something else! Let me know! I love talking trampolines!